Just the other night, I was having a discussion with a friend from out of town and we both somehow got on the subject of Steve Irwin, how he made wildlife education exciting, how he inspired our kids to take an interest in something more than video games and cartoons. Funny that both my friend and I had little boys who loved to dress in khaki and yell, “crikey!” Or maybe we’re like a lot of other mothers of boys who looked up to the man who believed the natural world was an intriguing place. Both of my kids took the role of wildlife warriors very seriously. They were and are animal lovers, and back in the day they really loved anything that had to do with — especially — reptiles. We often played zookeepers to our friend’s turtles, tortoises, lizards, and snakes while he was deployed and the kids charted hatchings, growth, etc. It was a wonderful thing to see their curiosity bloom with each development. 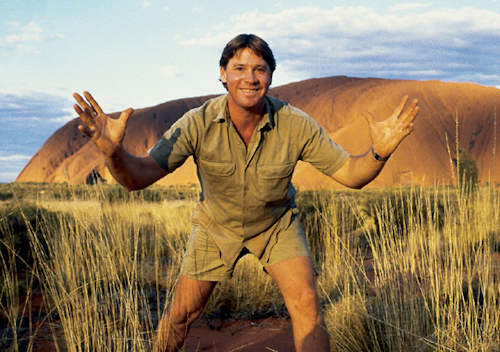 The world is far richer for having had the likes of Steve Irwin in it. And I, for one, still miss him. Hope y’all have your khakis on today. 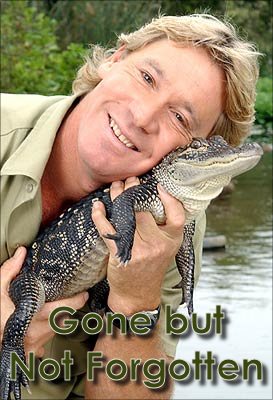 Four years ago, Steve “The Crocodile Hunter” Irwin died after a stingray barb pierced his chest. While in San Diego last weekend, I went into my storage unit to get a few necessities and I was greeted by a 3 1/2 foot plastic crocodile. My watch croc. It was the same one I gave LD when he was two. I’ll never forget that Christmas morning when LD saw it. He immediately jumped on it, covering the crocs eyes with his arm and calling his sister, “Terri”, to come grab his shirt and wrap it around the croc’s eyes. He said it all with an Australian accent. At age 2. It was that very same day that he insisted everyone call him Steve. And they did. Mojo, she was always intrigued by animals and eagerly jumped at the chance to help with any animals at every opportunity. She also played along with her little brother’s wild imagination. Most of the time. When we acted zookeeper for our friend’s turtles, tortoises, snakes, and lizards, it was one of my kids’ most exciting moments. They were keepers and working with herps, just like Steve! Feeding snakes, cleaning cages/tanks, watching turtles hatch — it was all very exciting and special and we did it together as a family. They knew without a doubt that no one else in the neighborhood had a turtle buried in their front yard like we did. That’s the sort of influence Steve had on our lives. And I will always be grateful that he helped nurture my children’s interest in wildlife, conservation, and natural science. Mostly, I’m grateful that we were able to turn that into meaningful family time. I wish I had Yeah, I’ll be wearing khaki as a tribute to Steve Irwin. Crikey! Who wouldn’t?